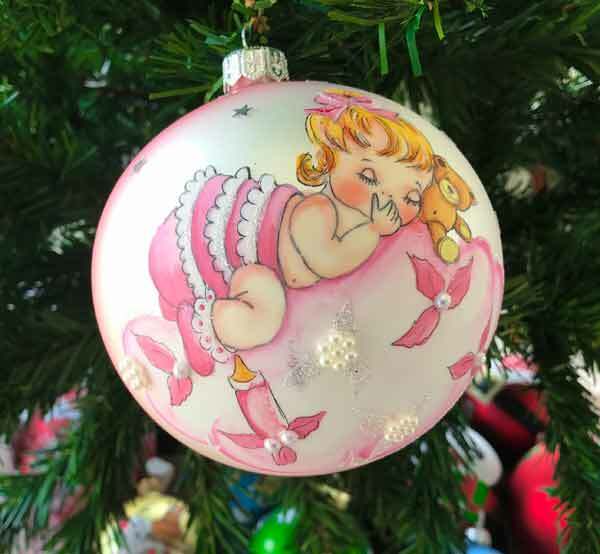 Pink and White Glass Christmas bauble with baby and teddy bear. Bauble has beautiful white gems and personalise with glitter calligraphy. A beautiful simple bauble with feathers that makes a great gift for a young girl or even an older lady.Bauble comes packaged in a beautiful box. You can select to have it gift wrapped if you wish. Stunning white transparent Glass Christmas bauble that has an Australian Kangaroo printed on the front. Personalise this Beautiful bauble for the perfect meaningful Christmas present. Dazzling glass pearl Christmas bauble with a twinkle of rainbow. The prefect sized decoration with customized calligraphy will be a spectacular addition to the Christmas tree.